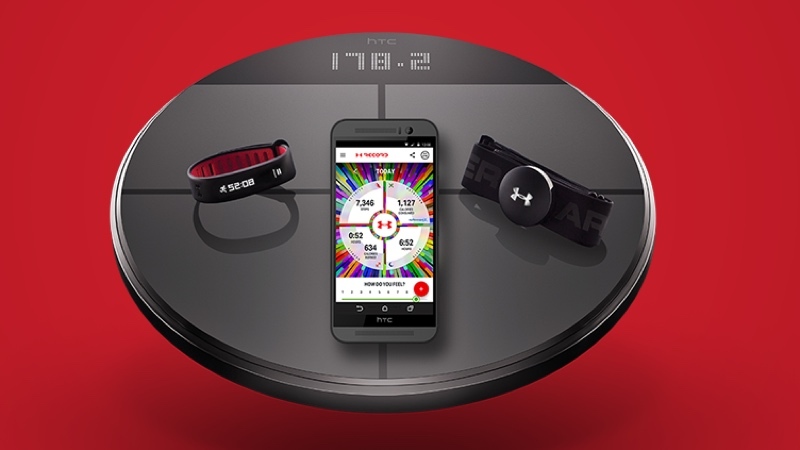 Under Armour and HTC have finally unveiled its first set of connected fitness devices and they all fall inside a new UA HealthBox platform. After the botched HTC Grip launch last year, UA is set to take on the likes of Garmin, Withings and Fitbit with its own ecosystem that includes the UA Band fitness tracker, smart scales and heart rate monitor chest strap. Until we've had our hands on all of the HealthBox kit, here's all you need to know about the new family of fitness tech. The headline-grabbing device here is inevitably, the UA Band fitness tracker. With a look that's very HTC Grip - not surprising given the Taiwanese mobile giant is a design partner - the Band is capable of all the usual activity tracking features we'd expect to see including step counting and sleep monitoring, and it also promises to measure resting heart rate with its built-in optical heart rate sensor. All of the data is displayed on an LED screen and when paired with the UA Heart Rate chest strap (more on that in a moment) it can also show off target heart rate zones during a workout. Other features include a silent alarm to wake you up in the morning and it'll use the same built-in vibration motor for inactivity alerts. Battery life will be up to 5 days and it'll use Bluetooth Smart to connect to other devices as well as the UA Record app, which has now been updated to support the new HealthBox platform. On the design front, it'll sit flat on your wrist with no sensors getting in the way of comfort (ahem, Microsoft Band 2), it's water-resistant up to 2ATM so should hold up in the rain but not in the pool, and has an adjustable band to get the right fit around your wrist. Alongside the Band is the UA Scale, something that was rumoured late last year and popped up as a listing on the Bluetooth Special Interest Group website. The smart scale joins the likes of Polar, Withings and Fitbit in allowing you to measure body weight and fat percentage syncing that data to the UA Record app over Wi-Fi. The water-resistant, battery-powered scale will work with up to 8 users, which is two less than the Polar Balance scale, but does have speaker notifications to give you audible updates on progress. It's compatible with iOS and Android phones and will support over the air updates to add extra functionality in the future. Last up is the UA Heart Rate. Set to give the MyZone MZ-3 among others a run for its money, the heart rate monitor chest strap will let you track heart rate, workout intensity and heart rate zones. As we've already mentioned, it plays nice with the UA Band and will connect to the UA Record app via Bluetooth Smart. This means you can view real-time heart rate zones on the band. It's been slapped with an IPX7 water resistance rating so should be okay for a run in the rain, but we'd suggest not taking it in the pool. The one thing that ties all of the HealthBox devices together is the UA Record app. Available for free for iOS and Android phones, Record can store and analyse data in real time pair with the Band, Scale and Heart Rate over Bluetooth. You can also expect to get further insights into data, take on fellow UA Record users and get recommendations on how to improve nutrition and get the most out of your exercise sessions. So when can you get hold of the UA Band, Scale and Heart Rate? According to the Under Armour website, the HealthBox devices will start shipping from 22 January. The whole setup, which includes all three devices will cost $400, which is not that bad when you break it all down. In the UK, it looks like it'll be more of a wait with the HealthBox kit expected to arrive in June. We've also heard that the Band will go on sale on its own for $180 soon after.